A few Christmases ago I received a Sears gift card and it was not too many days later that I was standing in the CRAFTSMAN section. I love to meander through the Craftsman tool section. Itâ€™s hard to explain the feeling of tools and their potential to build things. Â I was there for what seemed hours and went up and down the aisles looking at everything from screwdrivers to commercial table saws, sockets to tool boxes, things that I have no idea what they do, to other things that I have no idea what they do. I had several salespeople ask me if I needed any assistance, and I said, â€œno, just looking, thanks.â€ And I was really looking â€“ but I was looking for a tool in my price range that I didnâ€™t already own.Â You see, my father since the time I was young bought me tools for birthdays and Christmases so that by the time I had a family and home, I had enough tools to do basic repairs around the home.Â So I really didnâ€™t need any more tools. So here I was, looking for a tool to do a job in the future, that I donâ€™t even know what the job would even be!Â Would something break on my car that would necessitate a special wrench to get the part off? Would we get a hole in a pipe that would require a soldering torch? Would Uncle Hoo Pop fall through the ceiling that would require a dry wall square and various trowels and dry wall paste? Who knows what is going to happen? Last Thursday we had the local Brunswick Pack 277 Cub Scout Pack Meeting. This is where all the boys of all the age grades gather together once a month. We had planned the evening out at the Committee Planning Meeting earlier in the month. I volunteered to lead the night since we do not have a Cub Master. It is (kinda) required that once a year, at a pack meeting that a â€œFriend of Scoutingâ€ representative be allowed to give a sales pitch for giving to Scouts (above and beyond your dues). The year before, the representative talked for about twenty-thirty minutes (or at least it seemed that long). At the time to start our meeting, there was no FOS representative, so I began. We went through the Pledge of Allegiance, and various other scouting program items, and by the time I was finished, the representative had arrived and I introduced him. In my mind this would take us to the end of the meeting, and all I would need to do would be to wrap things up. But do you know how long he talked? Less than five minutes. As he neared the end of his presentation, which was over as soon as he began, I suddenly realized that we still had about thirty minutes left to our meeting. Sure we could end early, but not this early.Â All eyes were on me . . .
Have you ever been in a situation where what you had planned just didnâ€™t work? You ended way too early? The game is not working? The craft lasted about two minutes, but you thought it would take twenty?Â The FOS presenter ends way too early? Did I mention the FOS guy ended way too early! Sure, we all have. So letâ€™s go back to Sears.Â In whatever trade you are in, or role you play, we all have â€œtoolsâ€ in our toolboxes. These are skills, stunts, tricks that we learn to do what we do, and do it well.Â But we must constantly add tools to the toolbox. You canâ€™t fix every problem with a screwdriver. You can’t cut glass with a hammer. If you work with kids, then a tool may be a new game that you can pull out when the first activity sinks like the Titanic. Â If you are a public speaker, it could be a story, a joke, or a sermon that you keep on you all the time. If you are a magician, it may be a trick. But whatever it is, you are prepared so that no matter what happens you always have some way to keep going (even if things seem to be falling apart). 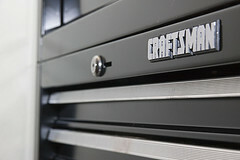 So as you meander through the aisles at Sears, what tools can you add to your toolbox that will help you in your trade? As the years go by, you will add more and more tools, so that eventually you will have a toolbox full of â€œstuff,â€ so that thereâ€™s not many things that could happen that will stop you. Even when you know that you are running on â€œPlan B, C. or even Dâ€ they will never even know the difference. I have some tools that I have yet to use (like these pick things, a mirror on a extendable stick, a spark plug socket, etc.) but thatâ€™s ok. You may have tools that you havenâ€™t used yet, and thatâ€™s ok. We are talking about continually seeking to add to your knowledge base, skills, and bringing your stress level down by being over-prepared. Â So spend the gift card, itâ€™s not doing you any good if it expires, gets lost, or slides around in your desk drawer.